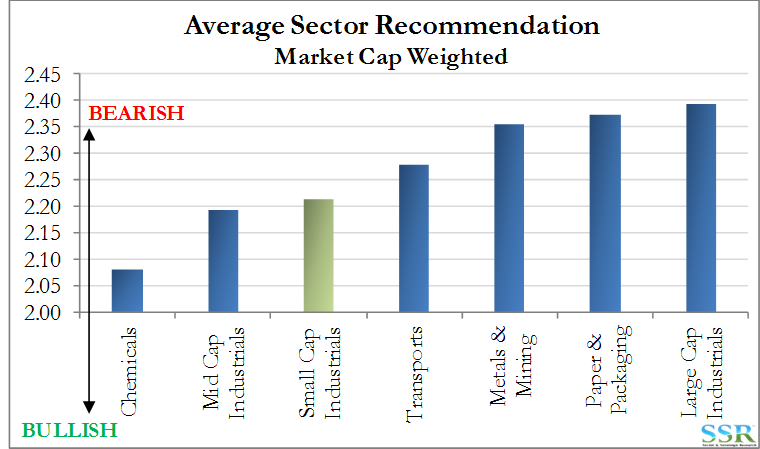 We define small cap industrials as Capital Goods and Electrical Equipment companies with market capitalization from $1-5 billion (in our work earlier this week, we defined large cap industrials as companies with market cap greater than $20 billion and mid cap from $5-20 billion). 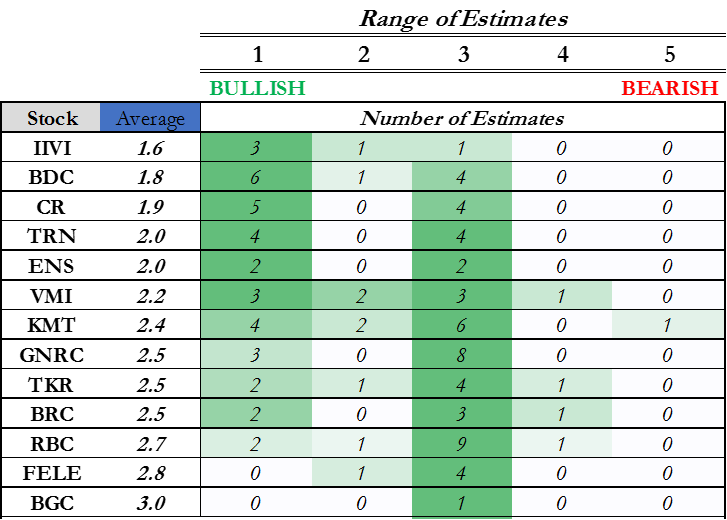 Sentiment for this small cap group is similar to that for the mid cap group – generally more bullish than in the large cap space – Exhibit 2 – and with a reasonable number of coverage/estimates – with the exception of BGC – Exhibit 3. 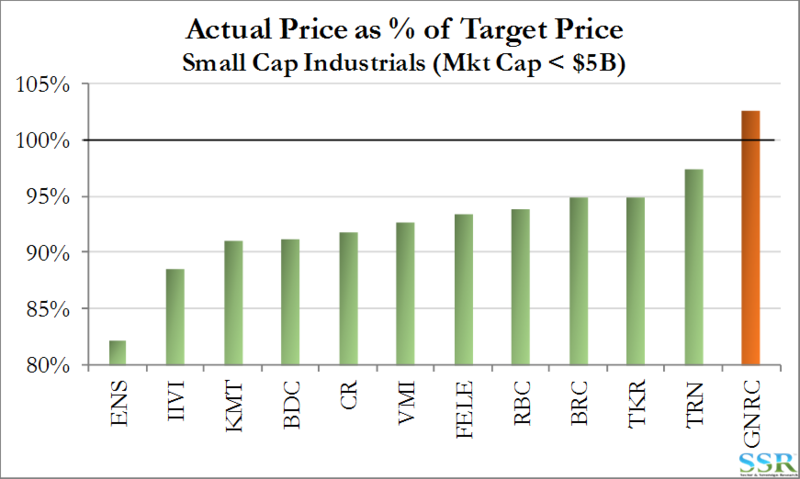 Unlike the large and mid-cap groups, most companies in the small cap cohort show upside to price targets – Exhibit 4 – more than half of the large/mid group is currently at or above target prices – see prior work. 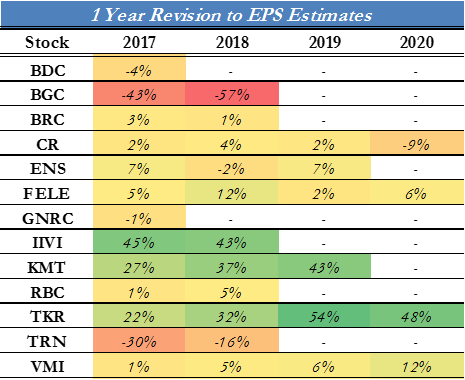 The scatterplots below mirror the analysis we did for the mid/large cap industrials groups in our earlier piece, and compare average deviation from 10-year average on several valuation multiples with revisions history (left chart) and earnings position versus trend (right chart). 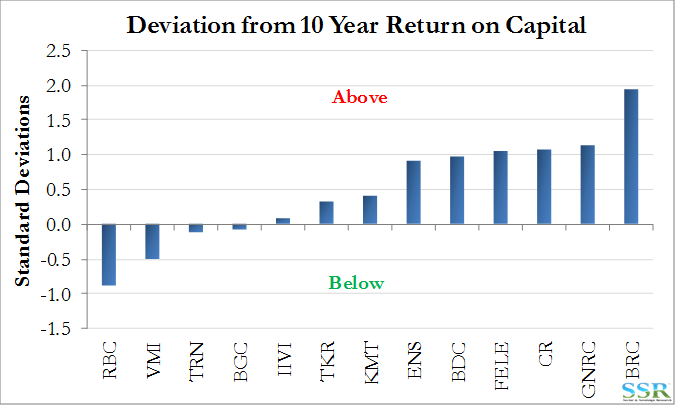 As with the mid/large cap group, valuations are generally elevated versus the 10-year history, significantly so in most cases. IIVI shows significant upside both to its target price as shown above and relative to its recent revisions as shown in the left chart of Exhibit 5 below. 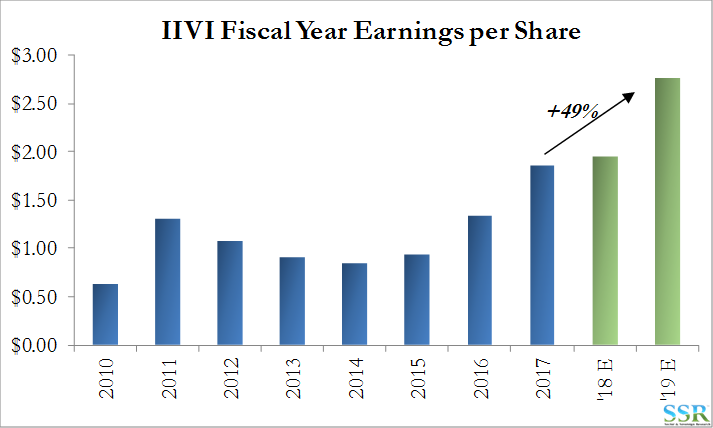 IIVI is less well supported by current returns, but momentum has been driving the larger cap market and IIVI certainly has the earnings momentum. 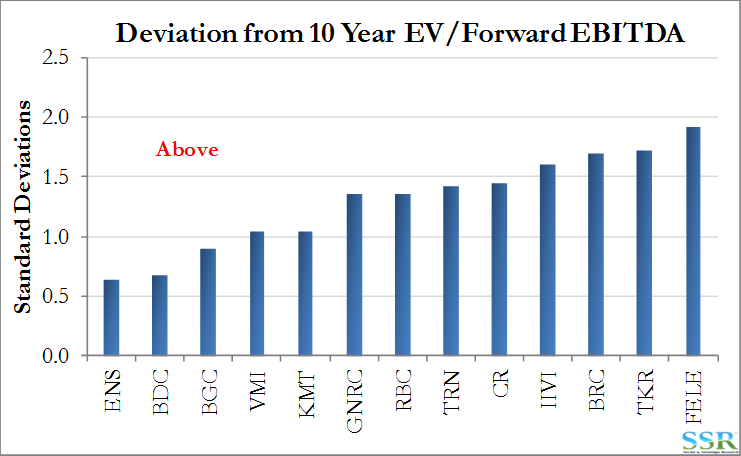 In the smaller cap space both the sentiment and the revisions data is less reliable than for the mid and large cap group because of fewer analysts covering the stocks – for example BGC only has one company providing estimates. Whether MiFID II makes this worse or better remains to be seen – it could result in fewer analysts and less small cap coverage or the emergence of multiple boutiques – some of which may choose to focus in the small-cap arena. In the Exhibits below we show some additional data for select companies and for the group. TRN is seeing a recovery in rail car orders and rail car backlog and should see additional repair/replace work as a consequence of Hurricane Harvey – Exhibit 7. 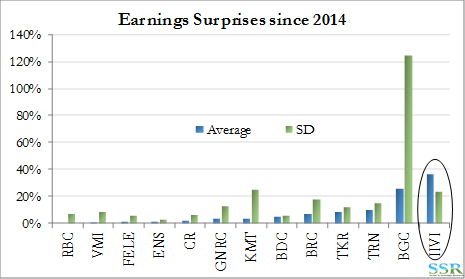 IIVI not only has the most consistent earnings surprises over the last three years – Exhibit 8 – but it also has almost 50% EPS growth expected in estimates between now and 2019 – Exhibit 9. This is no doubt a function of company guidance so we either have an optimist or an opportunity! TKR is the other company in the group with very high forward revisions and while current returns do not support the share price, if the earnings estimates are indicative of future performance the stock at least justifies its current valuation premium. 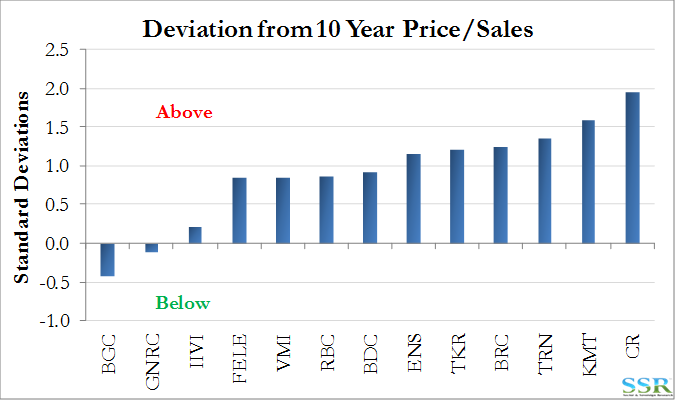 The charts below show the same valuation analysis that we included for the large and mid-cap names. The group of companies chosen is largely dictated by the length of history that we have to conduct this analysis. 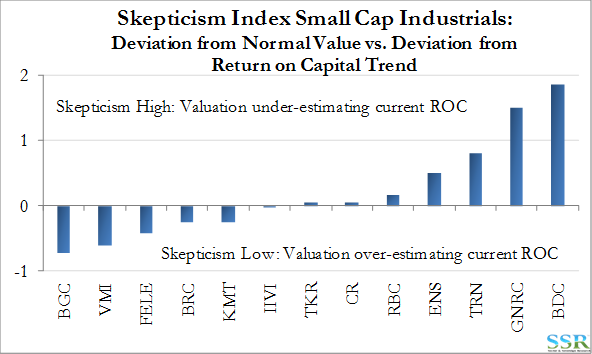 Ideally we are looking for companies that are relatively cheap on some, if not all of the valuation metrics, buts which have the return on capital support to suggest valuations should go higher – the return on capital data is summarized in the last exhibit (13), but the relationship between valuation and returns is best summarized in Exhibits 1 and 5. 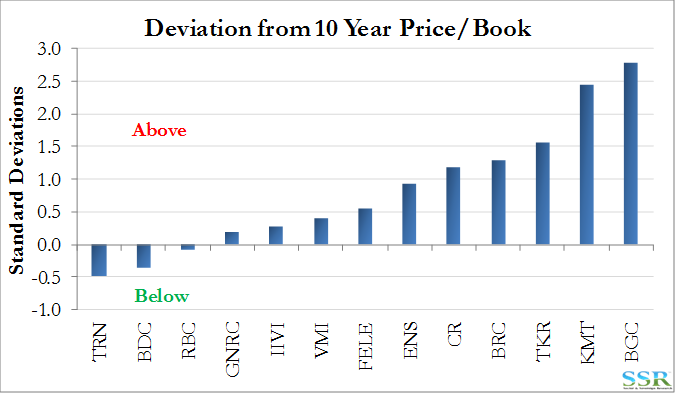 This analysis keeps our focus on GNRC, TRN and IIVI, and gives us reason to question the others.